Casualty is without question Britain’s best hospital drama and if you’re a fan of this long running show you won’t want to miss an episode. Unfortunately, as much as we love Casualty in the UK, it’s not really shown in any other country. So what happens when you go abroad? In the old days you would stick a 180-minute video cassette in the recorder and spend hours setting up recording times hoping there was enough space on the tape to record all episodes… or am I just showing my age here? These days things are a bit different. Now you could binge-watch Casualty on catch-up when you get back in the UK but depending on how long you’re going for who has time to be binge-watching hours of Casualty? There is another way and that’s by using an app called a VPN. 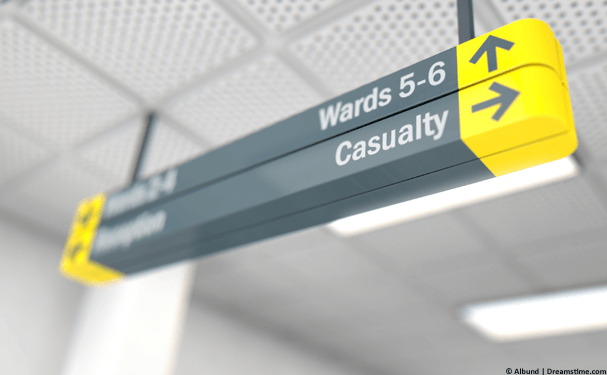 This will allow you to watch Casualty anywhere in the world, so if you’re off on holiday, an expat, a long term traveller or you’re outside the UK for any length of time you now don’t need to miss a single second of Casualty. Casualty is shown on the UK’s BBC channel. It’s also shown live and on catch-up on BBC iPlayer. BBC iPlayer is blocked outside the UK, even in the EU where some UK TV channels are available for a limited time if you’re a holidaymaker. To unblock BBC iPlayer so that you can watch Casualty you’ll need to download a VPN app. These cost a few pounds and come as a subscription service, although you can subscribe for as little as a month so it’ll only cost you a few quid. I recommend using a VPN called ExpressVPN because after many hours of testing I find them the most reliable for watching BBC iPlayer. They’re also really easy to use which is a bonus! Simply pick any of the three above and then follow the steps below. Choose one of the three listed VPN services from above, for example, ExpressVPN and sign-up for their service. It’s worth signing up for longer periods. For example, with ExpressVPN it’s 49% cheaper to take their yearly package than it is to pay monthly. Now you’re signed up you’ll need to download their VPN app to your device. I’ll be using ExpressVPN as my example but it’s much the same with the other services too. For phone or tablet users you can visit your usual app store and search the name of the service you signed up to, eg; ‘ExpressVPN’. If you’re using a computer or laptop then go to the ‘Products’ section of the website and download their app. Install the downloaded app and open it. The first time you use the app you’ll need to login with either the username and password you created when you signed up or the activation code. You can find the activation code in your welcome email or in the ‘My Account’ area of the ExpressVPN website. If you’re using a phone or tablet you should press the ‘…‘ next to ‘Selected Location’ and then choose ‘United Kingdom‘. On a computer or laptop press ‘Choose Location‘ (1) and then select ‘United Kingdom‘ (2). You’ll also need to press the ‘Connect‘ (3) button. Watch Casualty outside the UK. Now the VPN app is connected you’ll be able to watch Casualty. If you’re using a phone or tablet just open the BBC iPlayer app and watch as normal. See further down in this guide if you live outside the UK on a more permanent basis and don’t have the BBC iPlayer app installed or are having difficulties downloading it. On a computer or laptop you should visit the BBC iPlayer website where you’ll be able to watch either live when it’s shown in the UK or on catch-up at a time more suitable to yourself. When is Casualty show on TV? Casualty is usually shown once per week every Saturday evening. Expected times for it to show are between 8 pm and 10 pm. Often you may find it moves due to special events or other TV coverage. To see an up to date guide of when Casualty will be shown check out TVGuide. You can also use a site such as The Time Zone Converter to work out the live showing time in whatever country you’re in. Don’t forget though you can use the VPN to watch on catch-up also, you’re not only limited to live viewing. How can I download the BBC iPlayer app abroad? If you’ve got a UK registered phone or tablet you should simply be able to visit your usual app store and download the BBC iPlayer app directly. If you’re more permanently outside the UK and you bought your device abroad then you may be blocked from downloading the app. If you’ve got an Apple iPhone or iPad then read this guide which shows you how to download apps outside their intended country. Can I watch Casualty abroad on my Fire TV device? If you’ve got an Amazon Fire TV or Fire TV Stick then you’ll also be able to watch Casualty abroad on that. You’ll need to sign up for ExpressVPN the same as above. Then download the ExpressVPN app directly onto your Amazon Fire TV device by using the search function. Once installed, open it and connect to the United Kingdom. You can then use the Fire TV’s web-browser “Internet” (previously known as Silk Browser) or Firefox to visit the BBC iPlayer website and watch directly on your Amazon Fire TV device. Unfortunately, you can’t watch via the built-in BBC iPlayer app, you must access via a web-browser. To watch Casualty abroad you’ll need to get yourself a VPN app. I recommend ExpressVPN which you can get by clicking the link below. Sign up and download their app. Then connect to the United Kingdom using the app. Once you’re connected you can watch Casualty from any country in the world either on catch-up or at the same time it’s shown ‘live’ in the UK. Don’t forget ExpressVPN is 49% cheaper when taking a year package and they’ve got a 30-day money back guarantee just in case you can’t get it to work.